How terrific to receive a blurb on Margaret Carlberg, fiber artist living at Valle Verde, a Santa Barbara senior living community. Margaret: Maturity and Its Muse salutes you…a wonderful example of positive and productive aging! What do flowers and chemistry have to do with each other? Well, one area senior would tell you it has everything to do with each other. 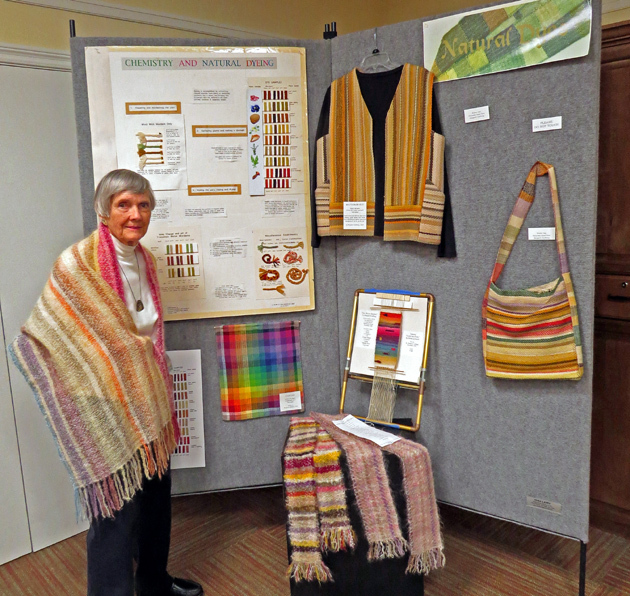 “Margaret is one who uses natural materials to make unique woven textiles and other of artwork. In 1998, Carlberg learned that her passions for chemistry and art could be combined, and she’s been “experimenting” ever since. She admits there have been some disappointing combinations, but when a color comes out just right, the mistakes are worth it. One of her favorite materials to work with is oxalis, or sour grass. Many consider the plant a weed, but for her, mixing it with the right chemical makes the perfect yellow color. She even uses an insect, cochineal, to make a beautiful burgundy dye. Carlberg has taken trips across the United States and the world to places like Thailand, Peru and Mexico to discover new and unique ways to combine nature with chemicals. — Dani Row is a publicist representing Valle Verde.